Hi, welcome to the Prophet Buddy production blog or the Prophet Bloggy. I plan to use this blog to post production pics, tell stories about my processes in making Prophet Buddy, also to explain jokes that I would only find funny. I thought it would be appropriate to start the blog explaining the origin of Prophet Buddy. A few months ago while sitting in a boring production meeting, I started making doodles as usual. I was thinking of Anna Chamber's stuffed animals at the time and was trying to draw something in a similar style. I drew a cat and a mouse sitting together on a wall. A wall because Charlie Brown and Linus always hang out at a wall, I figure that would be the best place for two good friends to hang out. Above the cat and mouse I drew them thinking about a corndog and a bottle of mustard. I love corndogs, and I love mustard even more. 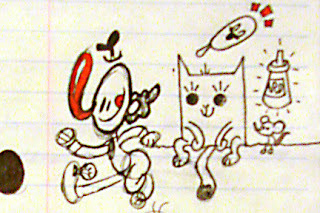 During the meeting I was making a story up in my head about the cat and mouse communicating to each other telepathically using images, my story was called "You Bring the Corndog, I'll Bring the Mustard." That doodle sat on my desk for months, but I never really had any plans for it. One day at work, I was giving back retakes to the animators. I had just finished giving back retakes to one guy, before I could call the next animator in to my office, that very animator I was going to call came in and asked for his retakes. I told him he was like a prophet or something, and then I called him my prophet buddy. Right as I said prophet buddy, I had looked down at the doodle sitting on my desk and it all clicked. 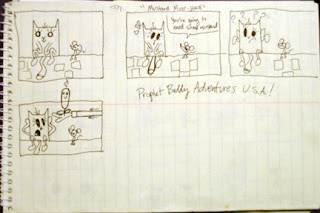 That day I made a quick storyboard (now the pilot), keeping a similar corndog and mustard joke as in the original doodle. The storyboard was only four panels long so I figured I could animate the whole thing in an hour, so I began designing it in the computer. When picking the colors of the characters, I wanted to make the cat and mouse an homage to Tom & Jerry, one of my favorite cartoons, so I used the same color scheme; blue cat and brown/orange mouse. That night I had come up with a few more episodes and decided that I was finally ready to do my own stuff again; the first time since Warner Bros. bought Go! Go! Moba Boy and shelved it forever. I was really excited to just do something that makes me happy without the snags. I didn't want to develop and jump through hundreds of hoops for the next several years, only to get nothing out of it again. The next day I purchased the domain and storyboarded more episodes. The episodes are all really short, basically one gag, that's why I refer to Prophet Buddy as a comic rather than a cartoon. People will probably expect more if I call it a cartoon, therefore I'll save myself the criticism, Prophet Buddy is an internet comic that happens to be animated. Several days later I asked Eric Bauza if he could do the voices for the characters and he agreed. I didn't really know what I wanted them to sound like; I sent Bauza an image of the characters and told him to come up with something. Bauza had said that he's always wanted to use the Mike Fontanelli impression that he uses at all of his auditions but always gets rejected. I'm really easy to persuade, so the Fontanelli impression it was for the cat, which made Bauza excited. But who for the mouse would complement the Fontanelli voice? I was racking my brain over it. One night, I started thinking about when I was working at Spumco and seeing Fontanelli around thinking about his voice and his conversations with the people around the office, then I was thinking of who worked there that had a really unique and distinct voice... our boss, Kevin Kolde. The next day I told Bauza via instant messenger, his response was "LOLOLOLOLOLOLOLOLOL." Thus, I had found the mouse's voice. The next week I got together with Bauza at Matt Danner's house to record the audio. Bauza suggested that Danner should do the voice for the mouse since he does a much better Kolde. Me + easily persuaded = Danner plays the mouse. The night I began official animation production I heard noises outside of my house. 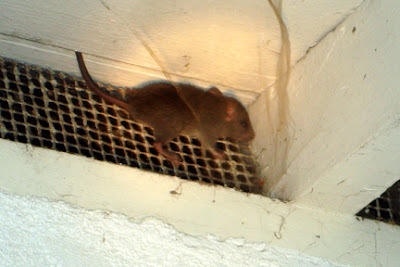 The noises turned out to be a little brown mouse... was this a sign of good luck, or was my exterminator just not doing his job? It's probably neither, I have some dirty neighbors! That's just a little tid bit of the origin, come back regularly for more behind the scenes of Prophet Buddy.